This is Mrs. Iveagh’s second year teaching at Divine Wisdom, and she could not be more thrilled to be teaching fourth grade for the 2017-2018 school year. Mrs. Iveagh graduated from St. Joseph’s College Brooklyn with a degree in Elementary Education, and went on to complete her coursework in Elementary Education and Educating the Gifted Child at Hunter College. She started her career at Our Lady of Miraculous Medal teaching kindergarten and then her path brought her to PS 102Q where she taught there for nearly a decade. She also taught second, third, and fourth grade there as well. Mrs. Iveagh was a leader of the Science Committee and a member of the Disciplinary and Curriculum Committees. After her time at PS 102Q, Mrs. Iveagh moved on to working part-time so she could raise her family. 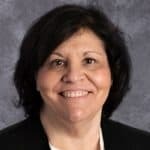 She worked as a teacher’s assistant within the Patchogue-Medford School District for the fourth grade classes where she provided support for students with Autism and developmental disabilities. For the remaining years and up to now, Mrs. Iveagh worked as a Health Care Integrator at SCO Family of Services, a child welfare agency, creating health plans for children with developmental disabilities and serious emotional disturbances. Throughout her career, Mrs. Iveagh has motivated and supported every student to becoming the best version of themselves that they can be. Her experience and background has helped her cultivate and develop an environment of passion and creativity for her students.